We’ve been hard at work implementing some of the most requested features on PacerPro. Together, we believe these new features help make our tool absolutely indispensable in the course of managing federal district cases. Downloading and labeling PACER documents quickly becomes time-consuming drudge work when you need to download more than one document. 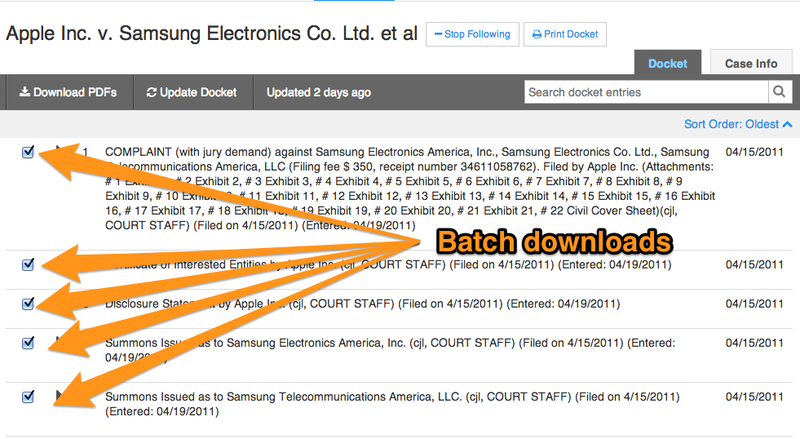 We’ve solved that problem by allowing you to download one or more docket entries simultaneously and by providing a sensible labeling convention automatically. Try it out! 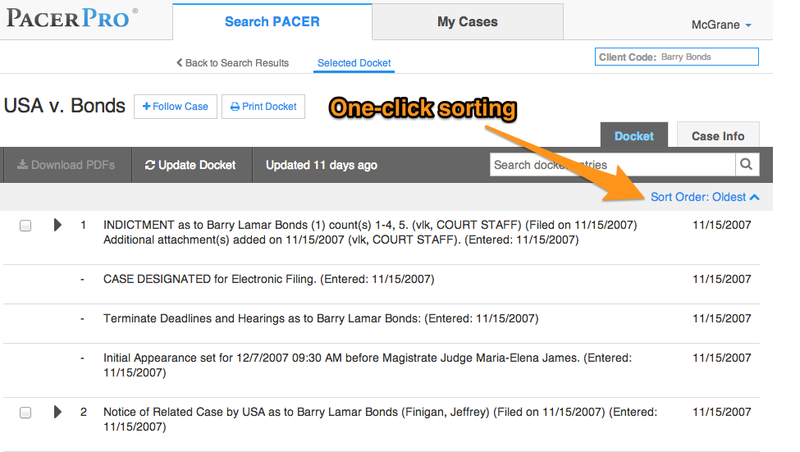 PACER provides their docket entries oldest-to-newest by default, which can be great for understanding the beginning, middle and end of case you’re new to. But for those of us staying on top of active cases we need just the opposite–the latest results right at the top. Now, with a single click of the order link, you can view entries whichever way you prefer. In the context of a legal team, support staff are often called on by attorneys to “print” the docket. To facilitate this common task, we’ve added a simple “Print” button at the top of the case page. 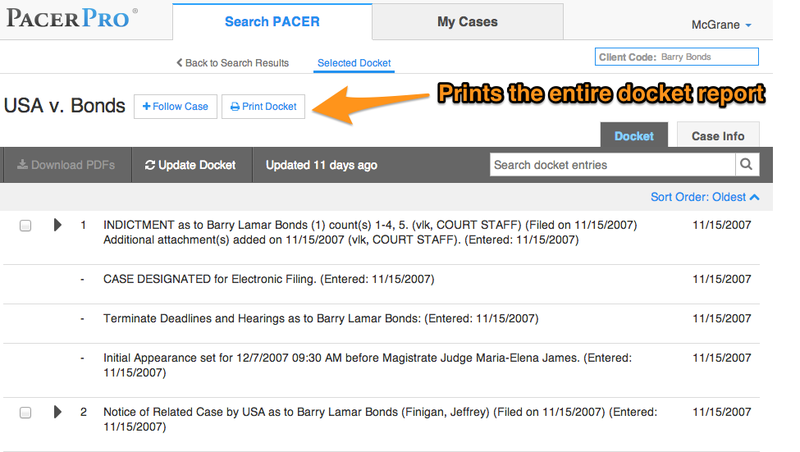 Clicking the print button will generate a facsimile of the existing PacerPro docket, including all of the biographical information that sits at the top of your standard PACER docket report. When you’re in research mode, every inquiry matters, even the ones that produce no results. You want to keep track of the ground you’ve covered, later be able to find the result sets that proved to be such a goldmine, and easily re-run searches when you suspect there may be new results. 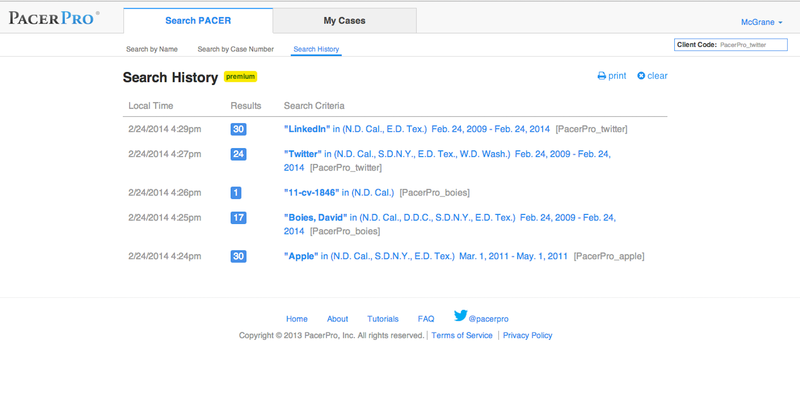 PacerPro’s new Search History feature makes all this possible, and more. Not only do we provide you a list of all the searches you conduct with an indication of the number of results they produced, but we let you print them for internal tracking and sharing. Go ahead and give our new features a try. We’re sure you’ll love them as much as we do.